22 | May | 2010 | can i just finish my waffle? I have not followed Kentucky politics nor Rand Paul’s political career, so I never had an opinion about him one way or the other. I noticed he did have a great victory, which I was happy about, and since he is a libertarion/conservative/tea party advocate, I should have known the corrupted liberal press and media would try to make mincemeat of him. Didn’t take long. Rachel Maddow, MSNBC, led the way. I have vowed not to watch MSNBC so I did not see this when it aired, but when I began to hear about her interview with Mr. Paul, I tried to listen to a video of it. Didn’t get all the way through it, but did notice that she had this pained expression on her face as if she had just swallowed a fly or something. But why oh why do these democratc/progressive/left wing people insist on digging up race bones? I could not believe she was going back to the lunch counters. Let me see, has that been about 50 or 60 years ago? Could we just move forward? No. Of course not. I imagine the little worker bees at Media Matters spent a lot of time trying to come up with some way to trap him with some controversy. They LOVE it when they can stir up something, perfect example is Al Sharpton going down to the Mexican border and inserting himself and his racism into something that was of no concern to him. Then we have George Stepho, ABC, interviewing Paul and bringing up the Civil Rights Act. First thing. Did not congratulate him on his win. Did not give him a cordial introduction. Slam. Bam. Back to 1964. It’s totally irrelevant anyway. But they are doing what they do. Smearing and slimming and misrepresenting. The democrats/progressives and their propaganda machine, the mainstream media. get on their high horse again and again acting like they have a gold star in race relations on their side. And it’s sickening because they don’t. They have a horrible record on race and human rights. Senate Minority Leader Everett Dirksen (R-IL) criticizes Democrat filibuster against 1964 Civil Rights Act, calls on Democrats to stop opposing racial equality. The Civil Rights Act of 1964 was introduced and approved by a staggering majority of Republicans in the Senate. The Act was opposed by most southern Democrat senators, several of whom were proud segregationists—one of them being Al Gore Sr. Democrat President Lyndon B. Johnson relied on Illinois Senator Everett Dirksen, the Republican leader from Illinois, to get the Act passed. Senate Republican Leader Everett Dirksen (R-IL) overcomes Democrat attempts to block 1965 Voting Rights Act; 94% of Senate Republicans vote for landmark civil right legislation, while 27% of Democrats oppose. Voting Rights Act of 1965, abolishing literacy tests and other measures devised by Democrats to prevent African-Americans from voting, signed into law; higher percentage of Republicans than Democrats vote in favor. So they really need to shut the hell up and get off Rand Paul’s back. He made a huge mistake to go on with them to begin with. He does not need them. They will not give him a fair interview. They are not fair in any way, shape, or form. I read that he cancelled a Meet the Press appearance with David Gregory tomorrow. Smart move, Mr. Paul. Nobody watches it any way. And as far as the Rachel Maddow show is concerned, it comes in last on Neilsen ratings – that is when Chris Matthews isn’t last. Here’s the absolute crap put out by George Stepho on ABC. Notice the one and only Robert Gibbs has to give his opinion. This is classic. Bill O’Reilly questions Glenn Beck about Anthony Weiner. Beck eats a hot dog throughout the whole interview. Laugh Out Loud. But as O’Reilly says, under a certain set of circumstances, it is not the least bit funny. 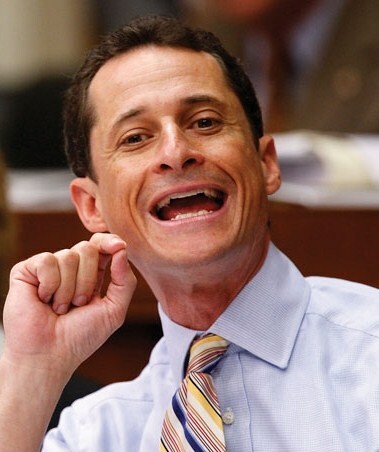 How much does Anthony Weiner weigh? 95 pounds, more? or less? Rumor has it Anthony Weiner and Jon Stewart were roommates after college. Is it remotely possible the White House is behind Weiner’s sudden interest in gold?